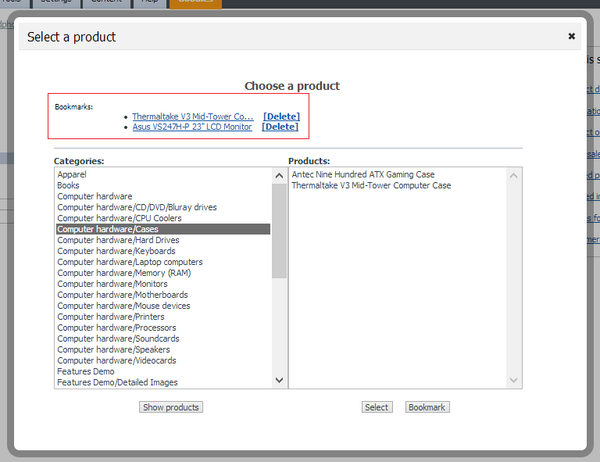 This article provides instrucitions on using the "Choose a product" dialog box. This dialog box opens when you need to select a product for some X-Cart features, like creation of upselling links in the Upselling Products module or adding a product to a certain order in the Advanced Order Management module. Choose the category containing the product that should be added and click Show products or double-click on the category name to see the list of products of this category. 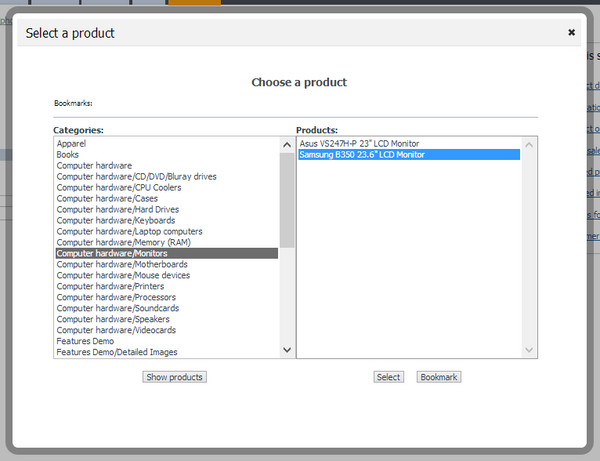 The list of products opens in the right-hand side of the dialog box. Choose the product that should be added and click Select or double-click on the product name. The dialog box closes and the product name appears in the corresponding field on the page where it should be added. While using the 'Choose a product' dialog box, you can use bookmarks. Bookmarks allow you to pre-select products (add products to a list of bookmarked items from which they can be quickly selected at a later time). Click once on the product name (it is highlighted). Click Bookmark. The product is added to the 'Bookmarks' list at the top of the 'Choose a product' dialog box. 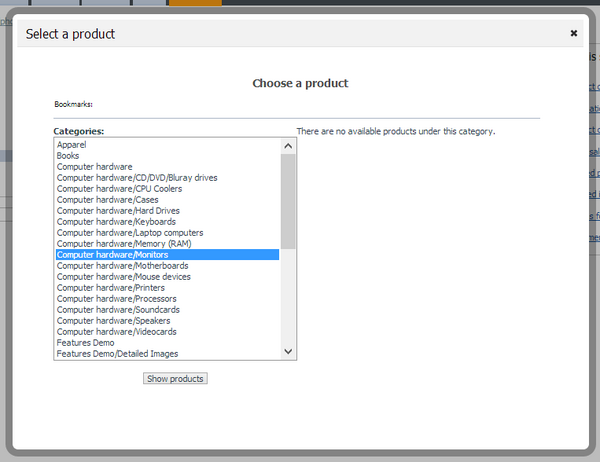 Find the product in the 'Bookmarks' list at the top of the 'Choose a product' dialog box. Click on the product name. The product name appears in the corresponding field on the page where it should be added. This page was last edited on 14 January 2014, at 14:24.